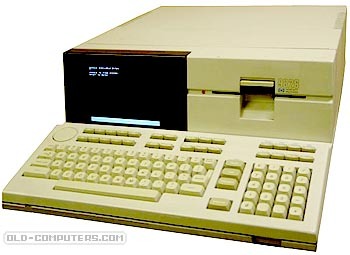 It was a robust and compact 6800-based machine which featured a 7" monochrome display, a complete keyboard (including first use of soft-keys and the scroll wheel at leftand), a 264 KB, 5.25" floppy-disk drive. On the rear panel, one also found one HP-IB port and 8 expansion slots. Like the 9825, it ran HPL, but could also run BASIC and Pascal. The Basic interpreter was developped by HP and was also known as "Rocky Mountain BASIC", or RMB. This version would evolve into the HP-BASIC for the series-300 and HP-UX machines. The 9826 was choosen and intensively used by the Walt Disney studios for "Tron", the first movie that used a computer to control all the processes implemented during the shoot, from camera adjustments to graphic and text superimpositions. see more Hewlett Packard HP-9826 Ebay auctions !